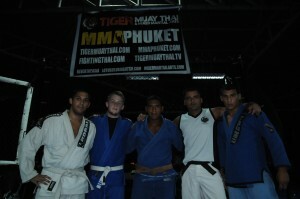 Tiger Muay Thai and MMA adds BJJ Gi Classes M-W-F evenings!! Tiger Muay Thai and MMA training camp, Phuket, Thailand will now be offering BJJ Gi classes on Monday-Wednesday-Fridays from 7:00 p.m. – 8:30 p.m in the evening when it is a little cooler for working in the Gi. The head instructor for the Gi program is MMA / Thai fighter Raphael Lopes Pinto. Raphael Lopes Pinto is a BJJ Brown Belt under Lattuf Kezen and is from Sao Paulo, Brazil. Raphael is 5-0 in professional MMA fights and had competed in many tournaments since training BJJ for the last 8 years. Raphael has also trained in Judo, boxing, capoerira and kickboxing, but his true love is BJJ.